October 30, 2015 – Through bold, vibrant illustrations and vivid stories, publishing company Bharat Babies’ diverse collection of books is the ideal resource for parents and educators alike to teach young generations of Indian Americans about their heritage and traditions. Many first and second generation Indian Americans grew up learning about their culture through stories told by grandparents and from reading Amar Chitra Kathas (Indian comic books) sent to them from abroad. These same generations are now raising their own children to be aware of their cultural heritage, a daunting task when available resources are limited. Recognizing the need for diversity in children’s literature, Bharat Babies is in an ideal position to bridge the gap. Bharat Babies’ newest story, Let’s Celebrate Diwali, explores how four faith traditions celebrate Diwali. Recurring character Harini and her classmates learn about many Diwali customs, including the exchanging of gifts and sweets, which remains a long kept tradition for many families, whether in India or the diaspora community. This holiday season, Bharat Babies teams with Sweet Silk Confections, a contemporary brand of confections that are Indian-inspired, to honor tradition through the ultimate gift set – a box of Sweet Silk sweets and a copy of Let’s Celebrate Diwali. Sweet Silk owner Shefalee Patel shares that “our companies have similar missions in teaching the next generation about our rich heritage and bringing it to light in a modern way.” Like Bharat Babies, the confections shop is driven by the desire to carry on traditions for younger generations of Indian Americans, making the two organizations ideal partners. Let’s Celebrate Diwali, is available now to order in time for Diwali on November 11, 2015. To learn more about Bharat Babies or to order books, visit www.bharatbabies.com and follow on Facebook and Twitter. 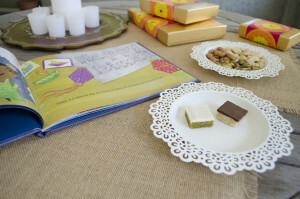 To learn more about the special Diwali Sweets and Book Gift Set, visit www.savorsweetsilk.com. Recognizing the need for age-appropriate and developmentally sound books about Indian heritage, Sailaja N. Joshi founded Bharat Babies in 2013. With five titles currently available, the publishing company works continually with authors and illustrators to design and produce developmentally appropriate books that tell the stories of India’s heritage and traditions for children from birth through elementary school. Sweet Silk Confections is a contemporary brand of confections comprised of unique flavor combinations and elegant presentation inspired by traditional Indian sweets. Sweets are vegetarian, gluten-free and an all-natural blend of nuts, fruits and fine chocolates. Each sweet is hand-crafted into a petite piece of confectionary delicacy ready to excite the palate and please the eye.